May the Coming Month bring Opportunities to Plant the Seeds of Change…. Welcome to my blog, established to promote the intelligent dialogue about the state of the dog in the states of the nation. To learn more about the National Dog Week Movement please read ABOUT. “…Dogs have given us their absolute all. We are the center of their universe, we are the focus of their love and faith and trust. They serve us in return for scraps. It is without a doubt the best deal man has ever made.” Roger Caras, American, 1928-2001. The other day, I posted on my Facebook wall that it was International Pooper Scooper Month (I guess it’s a problem in all corners of the dog world) and that the last week of April is Scoop the Poop Week. A few friends wondered if I was serious and I provided a link to an Examiner article I had written last year on the subject. One of the original tenets of National Dog Week was that dog owners be more responsible and considerate of the rights on non-dog owners, a concept that its founder, Captain William Lewis Judy, understood (even 83-years ago) helped to make the world a dog-friendlier place. As it was just Earth Day, you can also think of it as a way to be kind to Mother Earth. I actually had someone say to me that squirrels, rabbits and deer freely make deposits on our lawns, so why should she pick up after her dogs? I explained that those animals have a vegetarian based diet, and that is very different from most dog-diets in this nation. I’ve also been told by my friends who live on the water that the rain will just wash it away into the creeks, bays and rivers, and nature will take care of it. They are obviously wrong. 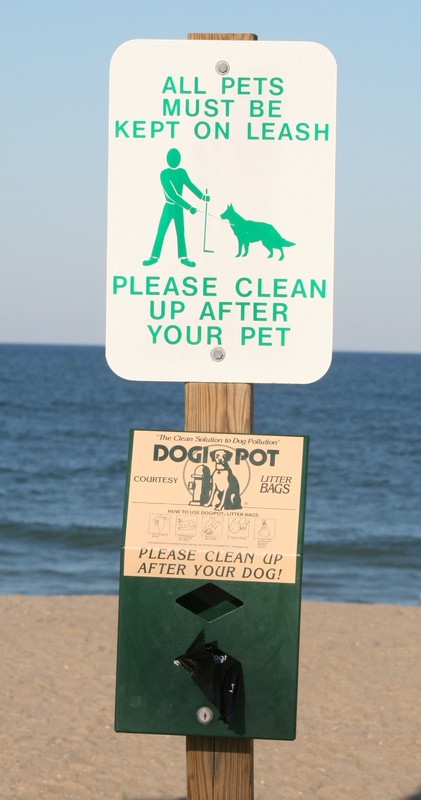 So be a good citizen, be considerate of your neighbors, the health of other dogs (dog poop can transport worms and parasites) and honor the planet you inhabit. The month of May is Go Fetch! Food Drive for Homeless Animals Month and its first two weeks bring us Be Kind to Animals and National Pet Week. If you go to http://www.examiner.com/pets-in-newark/lisa-begin-kruysman you can read related articles on these topics. This past week, I found myself thinking about the goodness of some people as I read posts on the walls of many of my pet-loving friends. If I could blog for a decade, posting every day, I still could not credit everyone, but I do try to write about people who rarely get any notice for what they do for the animals. Many of them work behind the scenes, asking only that attention be directed toward their cause. Many reach into their own pockets to help when funds run out to save a pet from an overcrowded shelter, spay and neuter dogs and cats, or get animals transported to safe shelters where their lives just might be spared. In May, I’ll be writing about Covers for Critters launched under Willie Wonka’s Project Pets and organized by Brenda Yohman Frick, Kathy Hart’s Mats4Mutts, catch up with Erika Friedman about her Kong project for shelter dogs and talk again about how Nikki Moustaki’s Pet Postcard Project is such a terrific and creative way to help shelters, among others. But first, I would like to wish Second Acts and its founder Michael S. Brown, my new Facebook friend, a happy birthday. Founded in 2008 by Michael, Second Acts is a non-profit fundraising organization distributing 100% of all donations it receives to small volunteer and animal rescue groups throughout the nation that adopt a no-kill policy. Michael also just celebrated his birthday this month, and speaking of that, if you would like to use the occasion of your birthday to make a difference for animals, you can go to the organization’s website to find out how http://www.secondactsfoundation.org. Please Like them on Facebook, too. Congratulations and Happy Birthday Michael. And on a final note for the month of April, I thank all of you who have supported me and my blog; by the end of March, we had celebrated 100 posts together. In May, I will be publishing a collection of short-tales with dog themes on Amazon, many inspired by the posts I have written on behalf of the National Dog Week Movement. With so many disturbing stories and wall postings out there in the world of social networking, sometimes people tune out and shut down. With my stories, I am trying to use a different approach to be thought-provoking, to inspire people to find some way to connect on an emotional level, and then be inspired to take a practical approach to help in their own way. I will be calling on some of my friends to help me with this new venture and I am confident this will be a win-win situation for all. If all goes as planned, I hope to help some causes that are dear to my heart and “write” some wrongs, one short story at a time, but I will need the support of many. Happy Pooper Scooper Week to all! Welcome to my Blog, a place where the issues concerning the state of the dog in the states of the nation are presented on a weekly basis. To read more about the National Dog Week movement, please see ABOUT. The month of April showers us with all kinds of meaningful observances; April brings us ASPCA, National Pet, Pet First Aid and Prevent Lyme in Dogs Month. But we are also in the middle of Autism Awareness Month and that, too, presents a fascinating link to the world of canines. Blog Note: The Month of May is Be Kind to Animals Month and this blog will be filled with stories about those who employ “simple” and direct ways to help all animals; Bags for Cats, Covers for Critters, Matts4Mutts, and Kongs for shelter dogs…how will you be kind to the animals during May and all year ’round? Of all of my first one-hundred posts on this site, the one that has attracted the most consistent interest was the one that presented NJ Dog Whisperer Janice Wolfe of New Jersey, and the work she and her Service dog, Wyatt do to help children diagnosed with Autism and Asperger Syndrome. That post can be read in the Archives of September 14, 2010. 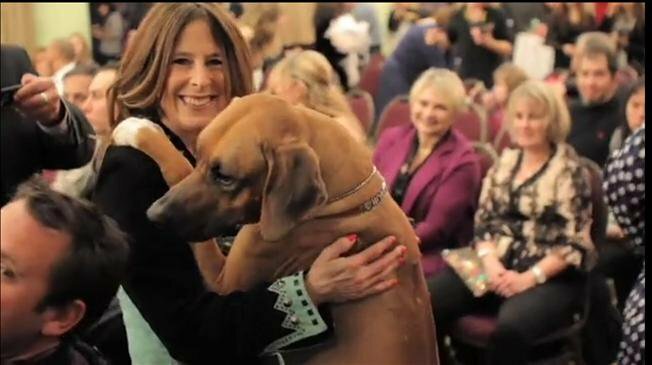 Janice and Wyatt have gotten a lot of attention since then due in part to the coverage they have received in media outlets like USA Today and the New York Daily News when Wyatt, a two-year old Rhodesian ridgeback, became the recipient of the ACE Award. Presented by the American Kennel Club, the American Canine Excellence (ACE) Award was bestowed on Wyatt for his incredible work with young people with special needs. LBK: Please explain why you continue to provide service dogs, free of charge, to children with special needs. JW: Through my organization, Merlin’s Kids (http://www.merlinskids.com) I rescue shelter dogs and train them to work with children diagnosed with Autism Spectrum Disorder and Asperger Syndrome. The dogs I train have been carefully selected by me and matched with a suitable child, and family. LBK: Can all dogs be trained as Service dogs? JW: No, not every dog is suited for this kind of specialized service work. I rescue and train Rhodesian Ridgebacks, Ridgeback-mixes and sometimes Golden retrievers. 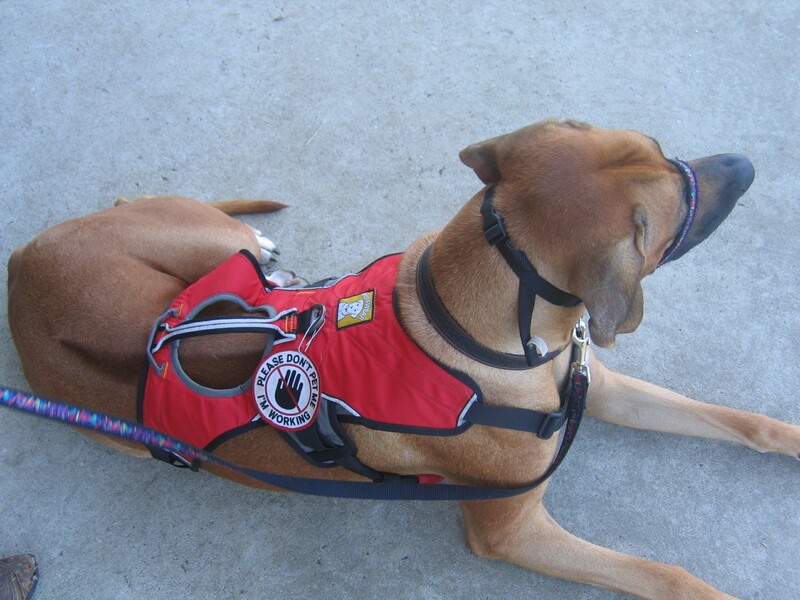 As a breeder of Ridgebacks for 23 years, I am very familiar with their temperament and capabilities, but not every Ridgeback will succeed as a service dog. Good service dogs are hard to find. Even among organizations that train them from puppyhood, I would say that only one in approximately eight will go on to become successful Service dogs. There are no guarantees despite the best efforts of the most qualified trainers. There are so many variables involved. Besides proper training, the most important aspect is placing the right dogs with the right kids, and their families. Out of every dog I rescue, only about two out of five will make it as a Service dog. Every dog is so different. My dog, Wyatt, for example, is a born natural. I don’t work with puppies, only adult dogs because their temperaments are already formed and by observing them and spending time with each dog, I can see if they are trainable or suitable for this kind of work. LBK: What does it cost for you to train a dog and how many do you “graduate” each year? JW: It costs between $8-12K to train a Service dog. In 2009, I placed 61 dogs, but last year, I could only place 28, unfortunately, due to lack of funds. LBK: Can you comment on your roles as a breeder and a rescuer? Is there a place for both in the dog world? JW: Yes, I think there is a place for both. Each year, I am likely to produce two Ridgeback litters. Many of my dogs go on to be Show dogs, too. I like to think that for each four new lives I bring into the world through my dogs, I rescue about sixty or so. But on that note, it is a sad fact that somewhere between 4 to 6 million dogs in this country are put down each year, so in rescuing the ones that I can, I hope I am doing some good. LBK: While it is obvious that the highly trained dogs you provide bring security and comfort to so many, are there any drawbacks? JW: The most important thing for these kids is their socialization and the learning of life skills. While a dog can help these kids to be independent, it should not become a crutch. There was the case of one little girl in Florida who was diagnosed with Asperger Syndrome. She wanted a dog that would protect her from classmates who were teasing her; a friendly companion who she could use as a buffer between her and the world. While this is understandable, it doesn’t solve her problems of being an active participant in the world, so it was agreed that she could bring her dog to school each Friday afternoon. LBK: Can dogs really be part of the classroom experience? JW: Under the law, it is your right to have a Service Dog where and whenever one is needed. I am an advocate for Service dogs in the classroom. Of course, there are many considerations involved. The school must be supportive, and the teacher must become part of the training program. Safety for all of course is extremely important. If you give a child a dog he or she cannot handle, it is like giving a ten-year old the keys to a car. LBK: You talk about Adaptive Behavior Therapy (ABT), can you explain this concept? JW: IN ABT, the therapy must be suited to the individual. No two autistic children are the same and will not respond to the same treatment; the one-size fits all mentality does not work. I would love to work with more trained therapists who are in-line with this approach. LBK: Tell us about your plans for the Merlin’s Kids Camp for children with Autism Spectrum Disorder. JW: Our plans are moving forward, but slowly. The camp, that is being designed with the input of my good friend, Temple Grandin, will be a haven for these kids and their families. It will be a place filled with dogs, horses, alpaca, guinea hens, reptiles and fish. It will offer a Wild West theme, providing opportunities for attendees to learn work and life skills while having fun. This is very important, because one of the greatest fears these parents have is what will happen to their child when they are not able to care for them any longer? This camp will give them hope. But, as you can imagine, this all takes a great amount of money and resources. We are in need of so many things, among them, cash donations, barn wood, furniture donations (with rounded edges) the services of contractors, building supplies, pet food and supplies for the animals, legal services, etc…You can go to the Merlin’s Kids Website to find out how to make donations. In her work, Janice embodies the true spirit of Captain Will Judy who started the National Dog Week Movement 83 years ago to celebrate the value of dogs in our world. I thank Janice for taking time to talk with me. I encourage you to go to http://www.merlinskids.com to read more about her work. In January 2010, I launched this Blog to help relay the mission of the enduring American tradition of National Dog Week. To learn more please see About. For those who don’t know, blog is short for biographical-log, an on-line bio that is usually written around a theme. In my case, I started with an ambitious goal of three posts a week, with personal observations of dog-related issues. In time, my posts became a way for me to present individuals who truly relay the message of National Dog Week, on a weekly basis. Reaching the big 100 Post milestone, I wanted to celebrate with a special posting, I asked my loyal Portuguese water dog, Hooper to interview me on life as a blogger and writer. Without further delay, I present the Hooper Interview (after she eats of course, and does her business). This interview is taking place on April 1st in Key Colony Beach, Florida. H: Thanks for the walk…Where do I start? What did you do before you wanted to be a writer? LBK: Well, much like our hero, Will Judy, the ultimate dog-enthusiast who was the publisher of Dog World Magazine for 36 years, and founder of National Dog Week, I worked at many different kinds of jobs…After graduating from the University of Connecticut I was a waitress in Edgartown, MA, sales person in a sporting goods store on Cape Cod, MA, Human Resources Associate/Recruiter for Home Box Office in New York, ice-skating and swimming instructor, substitute teacher…and of course as a fine artist for the past twenty years. H: Where are some of the places you have lived? LBK: I grew up in Hackensack, NJ, lived in Boulder, CO when I was 14, went to school at the University of Connecticut spending summers on Martha’s Vineyard and Cape Cod, MA, Greenwich Village in New York City, and now I call Ocean County, NJ home. I have also spent a lot of time in St. Augustine, and the Florida Keys for the past several years, something I hope to do more of. And then there was that month in Italy! H: What has been the best and worst part of starting and maintaining a blog? LBK: Well, the hardest part of blogging is delivering interesting and meaningful material on a weekly basis. Fortunately, when it comes to dogs, there is no lack for material…Did you know there are over 70 million of you guys in this nation? But cats still have you beat so watch out! The best part of blogging is getting to know so many great individuals who work so hard on behalf of the “Cause for the Paws.” In telling their stories, I hope to inspire others to get involved or find their own niche. I like to think of it as “The Little Blog that Could.” Most people are more than happy to talk to me and in doing so, I get more people to stop by and read! Oh, and it also helps spread the news about my book project. H: Your book is titled Every Dog has its Week: How Seven Days in September came to celebrate Dogs and the Humans who Love Them? Why did you write it? LBK: For years I’d wanted to write the “ultimate” dog book, a project that would inform those entrenched in the “dog-culture” and those who were not as enlightened. I think those who make their living in dog-related industries or are active in dog-causes make the mistake in assuming that the general public is as knowledgeable about dog issues as they. For example, I still talk to people who don’t understand that when they purchase a dog in a pet shop, they are promoting puppy mills, that think dog-fighting is declining because of the Michael Vick “chapter,” or don’t realize that some breeds are no longer legal in some cities. Also, many are not aware that so many dogs are still euthanized or languish in shelters every day, and that so many still do not spay and neuter their pets. Also, there are so many ways dogs help humans in the therapy and service areas. Back in 1928, Will Judy faced his own challenges when it came to improving and honoring the lives of dogs in this country. His contributions through writing, publishing and the establishment of National Dog Week (the last full week of September) made a difference. In some ways, I see myself as trying to carry on his work, with the help of many others. H: Has it been difficult? H: What’s been the most rewarding part of writing this book? LBK: That’s easy. Really caring about the subject matter and truly knowing how inspiring the message of National Dog Week and its promoters can be for so many. I see the week as a way to teach our young people the value of caring for animals, so that a more caring generation will go forth. Also, I derive encouragement from those I interview…Nikki Moustaki of the Pet Postcard Project, Bocker the Labradoodle and his Mom, Marie, fellow-author and blogger, Lisa Pliscou, Erika Friedman of Canine Celebration, Rose Russo-a truly inspirational person, Janice Wolfe and her work with autistic children through her dog Wyatt, Josh Abrams of Dogasaur who has helped spread the word to so many, Babette Haggerty, daughter of legendary dog trainer, Captain Arthur Haggerty, and so many others…best-selling authors, trainers, rescuers….the list goes on (please scroll through the archives to meet them). It’s also been nice to be an interviewee, too! H: What is your goal for National Dog Week? LBK: For it to be observed more widely…for everyone to find something to do to honor it, no matter how small or personal. On a large scale…to see it celebrated on the Plaza of Rockefeller Center in New York City in the spectacular manner and style it once was in the 1930s-1950s…that would be fun (I’m working on it…Al Roker, are you listening)? H: What’s your favorite way to spend time with me? LBK: I love taking you for walks. Everyone asks if you are a Labradoodle! When they hear you are a Portuguese water dog, they have so many questions. They love to pet your soft wavy coat and love your one white paw. We meet so many nice people. You are also a great snuggler, a great doggy-pillow or foot warmer and you make me laugh every day. I am grateful to have a dog like you, and for the support of my husband, Rich and of friends and family who are always there for me. H: Thanks, Mom, and thanks for blogging about my peeps…I look forward to going to Dog Fest in Brick Township (our adopted home-town) this September and I hope that all my canine friends get their day, and week, too when others plan some special events! LBK: Thanks, Hooper…now let’s go take a run on the beach. To read more about my artwork, please go to http://www.postcardart.us.